For years, Devonia Grashio stood behind her man, Air Force Col. Samuel C. Grashio. She watched him go off to war in 1941 as a flying cadet in the Army Air Corps. When he went missing, she took a course in drafting at Gonzaga University and went to work for Boeing to support her children. Her husband returned a year later and gained much attention as a survivor of the Bataan Death March and one of few to escape a POW camp in the jungles of the Philippines. As she nurtured others while raising a family, she found artistic expression in ceramics but refrained from painting. “I painted a landscape in grade school with purple hills and a red sunset,” she said, “One of the sisters told me that I couldn’t use red with purple. That stopped me on the spot.” Still, her desire to paint remained; dormant but eager to emerge. She remembers her first inspiration coming from a painting her husband found in Italy in the 1950s and the thought crossed her mind that one day she could and would do that. That day came in the late 1990s when she signed up for a class at Spokane Art Supply. Her first lesson was a still life. She moved on to more individualized attention with a few lessons from local artist Sister Betty Bradley and then she was off; fully emerged in art. She works in watercolor on a drafting table in the living room of her South Hill home where the walls in every room are filled with her elegantly framed work. The subjects include birds, animals, flowers, fruit, landscapes, old farmhouses and, her favorite, children standing in a frothy shore with their hands joined. 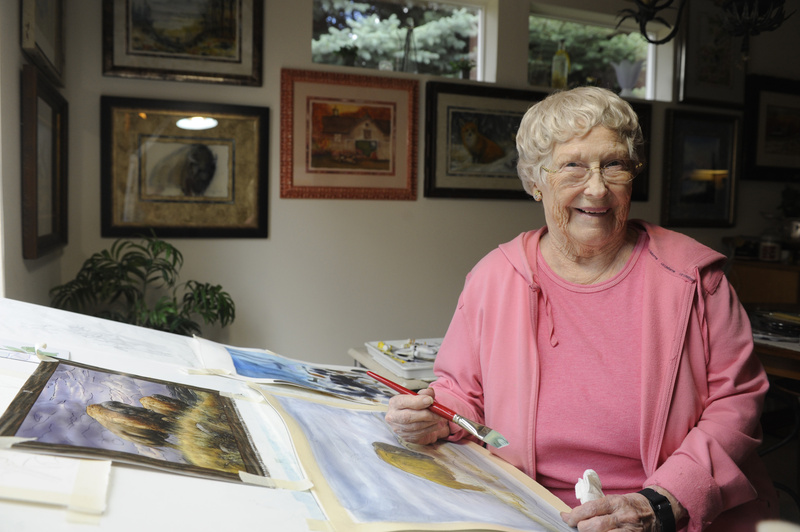 She paints every day, recording the beauty that has touched her life over the years. “I get these things in my heart and I have to paint them,” she said.